A couple of weekends ago, I was on the hunt for merlot colored cardstock for one of my customers’ wedding invitations (which I’ve learned, is quite difficult to find … so if any of you consider going into the cardstock making business, here’s a suggestion for you!) so we drove up to Ink About It in Westford. And since we were way out there already, I convinced Tony to take me to the new H Mart Asian grocery store in Burlington afterwards. First of all, let me just preface this by saying that you could call us crazy. Crazy as in “who the heck would dare go to an Asian grocery store on a weekend? !” We should’ve known at the moment when the police officer standing in the middle of a street was diverting traffic (us) to go around the way to get into the parking lot that we were in for some pretty intense crowdedness (is that a word?). We were quite lucky to find a parking spot, which is good because I think my husband was going to shoot me for suggesting the idea in the first place. And then we walked in. And wow. So much to take in. A bakery on the right. A wall of rice bags. A gigantic produce section. A food court where they have Korean, Japanese, Thai food and more to choose from. I really liked the cute little outfits the women were wearing in the bakery … and of course, they’re green! There was a wall of kimchee. A wall of those cool little side dishes that you get at a Korean restaurant. Tons of fresh seafood options. And lots of meat! I know that these grocery stores are quite common in places like California, but they are few and far between aroudn here so I apologize for my over-the-top reaction. 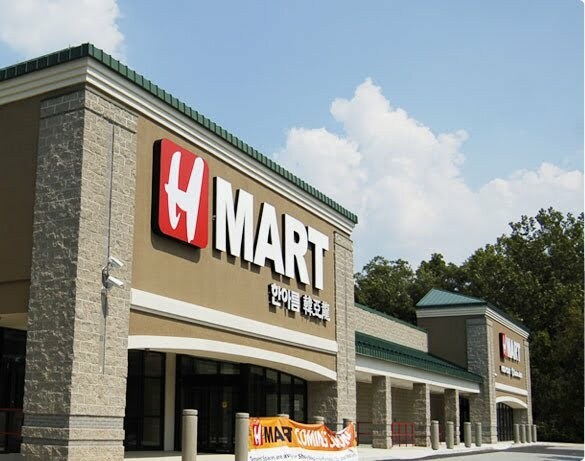 Oh and now I remember that I did have a purpose for going to H Mart (not just to annoy my husband – ha! ): I needed to get the mochiko (rice flour) and matcha (green tea) in order to make Matcha Mochi cupcakes for the cupcake throwdown competition at work (another post!). Mochiko. Check. Matcha. Check. Let’s see, what else did we leave with? 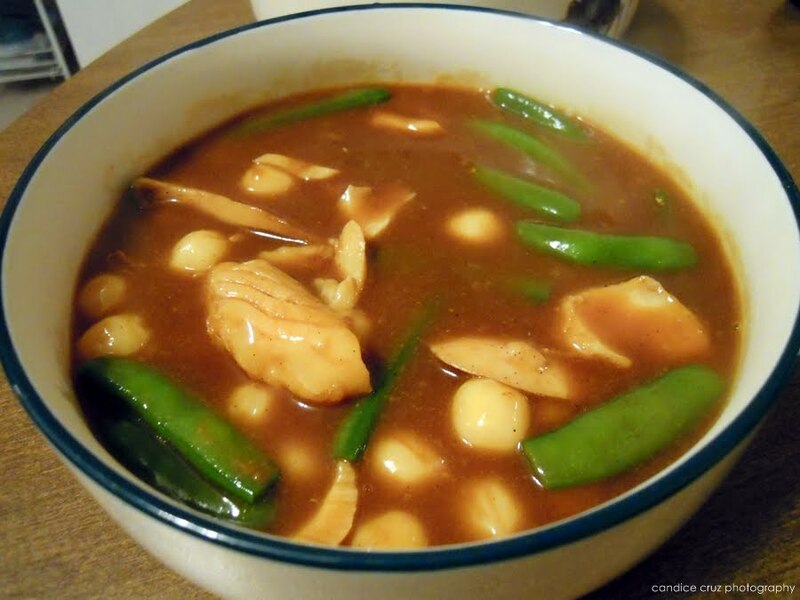 A container of those little soy black beans (Kongjaban) that Tony loves. Two packages of curry after trying a sample. Two packages of small rice cakes shaped like little balls. A package of thinly sliced bulgoki meat. Some really big mushrooms that I can’t believe I didn’t write down the name of. And more that I can’t remember now. That night, I ended up using a bag of the rice cakes to try and recreate the curry dish that Tony sampled at the store. It turned out a little too soupy for his tastes (I’ll have to use less water next time). I put some cod, those forgotten mushrooms, and snap peas in it too. 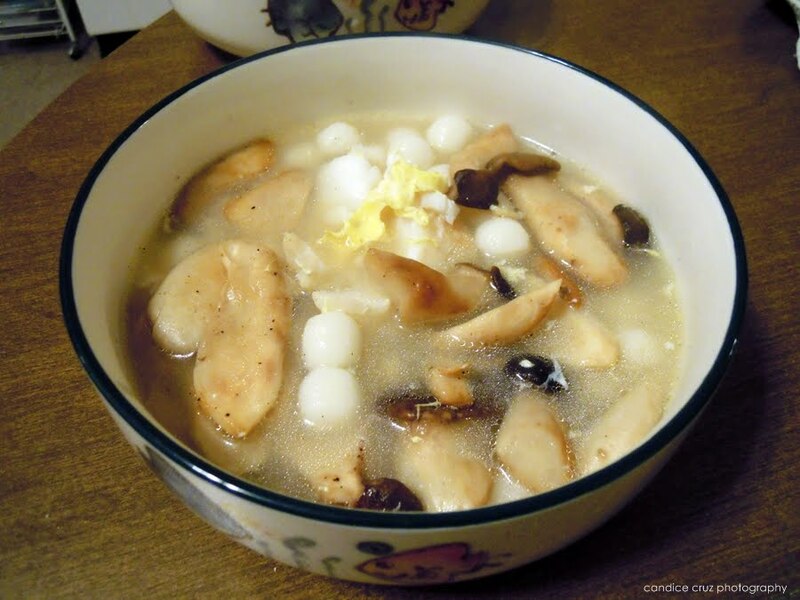 And my dinner was essentially a rice cake soup that started off as boiling water that was used to cook them in, and I added an egg, a couple of anchovies (for flavor), and mushrooms. It was quite delicious actually … I love the texture of the rice cakes. This entry was posted in asian, burlington, market by shortcakescraps. Bookmark the permalink. You two are brave going on a weekend. Going to an Asian grocery store on a weekend is like going into combat. Liked the pics since I haven't had the chance to make it up there. I get crazy excited when I walk into an Asian grocery store, too. Looks like a great store! So… how did your cupcakes turn out, Candi? !